A robot driver controls a robot that is connected to a computer. A robot driver uses a generic software interface to control and monitor a specific robot controller, enabling a computer to control a robot. Robot drivers provide an alternative to Offline Programming (where a program is simulated, generated, then, transferred to the robot and executed). With robot drivers, it is possible to move a robot while it is being simulated (Online Programming). Any robot simulation that is programmed in RoboDK can be executed on the robot using a robot driver. The robot movement in the simulator is then synchronized with the real robot and it is possible to debug robot programs in real time. Note: Robot drivers are located in the folder /RoboDK/api/Robot/ by default. Drivers can be Python files (PY format) or EXE files. Note: Robot drivers are not post processors. Post processors allow generating a program to be executed by the robot controller (Offline Programming). More information in the Post Processor section. Important: Most robot drivers use a TCP/IP socket communication protocol. It might be required to purchase an additional software option for some robot controllers (from the robot manufacturer) as socket communication might not allowed by default. Note: End users can add or modify existing robot drivers, then, link the new drivers in the Robot Connection menu. More information in the how to customize a driver section. A green message displaying Ready will appear if the connection was successful, as shown in the following image. Tip: Use the ping button to test if the robot is connected to the computer. Important: Some robot controllers require a specific setup or activating a specific option on the robot controller. Follow the instructions for your robot. 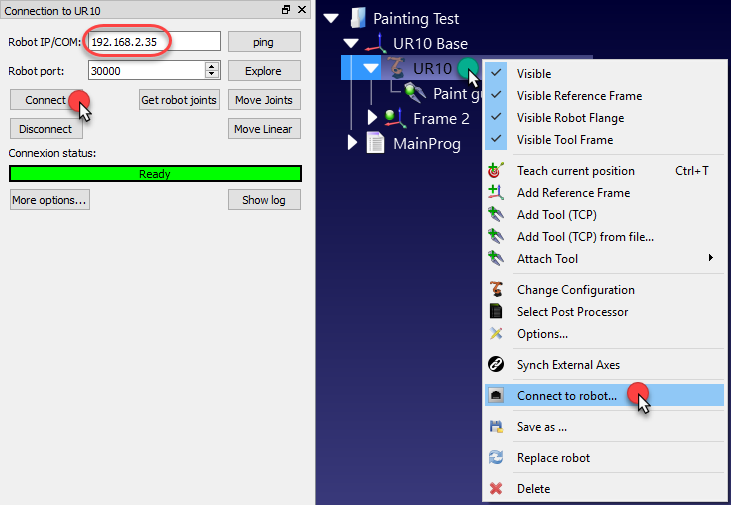 Tip: Select Get robot joints to retrieve the current robot position from the robot and update the position of the virtual robot in RoboDK. Tip: Double click Disconnect twice to force the driver to stop. The driver might become unresponsive if the robot stops unexpectedly (due to a collision or axis limits for example), in that case, the driver can be restarted by double clicking Disconnect, then, Connect again. 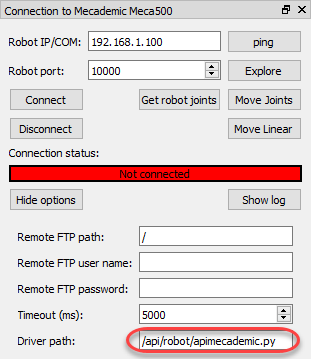 Tip: Robot programs can also be generated offline and transferred through FTP if the robot and the computer are in the same network, as shown in the Transfer Program section. The robot driver is not used in this case. 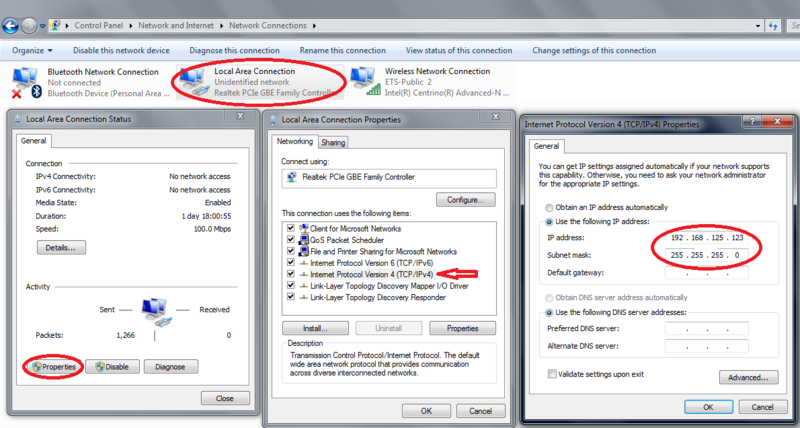 Provide the IP, FTP user name and FTP password by selecting More options in the robot connection window. Then, programs can be transferred when selecting the option Send program to robot (Ctrl+F6). Note: Programs created using the RoboDK API can also be used to move the robot in real time. More information in the Using Drivers with the API. Note: The Troubleshoot section provides more information if the connection does not work. The program should start on the real robot and the simulator will follow the robot movements. The Connection status will display Working… in yellow when the robot is busy. Note: The program icon should be updated as shown in the following image to shown that the program is running on the robot. It is possible to control the movement of a robot from the RoboDK API, for example, to program a robot from a Python program or a C# application. The program should start running on the robot and the robot connection status will be updated accordingly. Tip: Select the macro SampleOfflineProgramming.py from the C:/RoboDK/Library/Macros/ folder to test it with a hexagonal path around the current location of the robot. 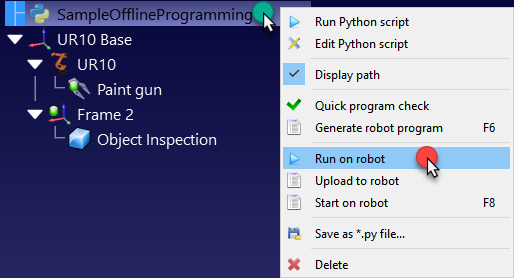 If the program is executed outside the RoboDK’s GUI (for debugging purposes, or if we are using the RoboDK API for C# for example), we can set the RunMode using RDK.setRunMode to RUNMODE_RUN_ROBOT. This will force the program to run on the robot. 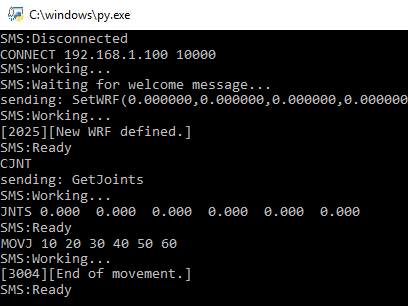 It is also possible to establish the connection using robot.Connect(). Note: RoboDK automatically sets the RunType to RUNMODE_SIMULATE by default the RoboDK API is started, unless a Python program is generated or set to Run on robot using the GUI. Tip: Select the macro SampleOnlineProgramming.py from the C:/RoboDK/Library/Macros/ folder for a more complete example. Also, more examples of online programming using the Python API and the C# API are available in the RoboDK API section. One robot driver is a standalone console application. Robot drivers can be developed using any programming platform, for example, they can be a Python module (PY format) or any executable programs built under any development environment. The robot driver allows communicating with a robot through the command line. The same commands that can be manually executed are also used by RoboDK to drive the robot from the PC. Each robot driver can be run in console mode to test it. A sample Python driver (apimecademic.py) with its source code to control Mecademic robots is available in C:/RoboDK/bin/robot/. Some robots support monitoring the joint position in real time. In this case it is possible to provide joint position feedback as the robot moves by sending the JNTS_MOVING command. When the driver is run from RoboDK, the virtual robot will follow the movement of the real robot in real time. A new command will not be processed until the Ready message is sent. Note: When the driver is run from RoboDK, any message sent with the prefix SMS: will be displayed in the Connection status bar. Specific messages are displayed with specific coloring such as Ready (green), Working (yellow) or Waiting (blue). Any other messages will be displayed in red. The interaction with the console and the connection to the robot are managed by the one Python module for the Mecademic driver. The interaction with the console should be the same for all robots, as described in this section. However, the interaction with each robot depends on the robot manufacturer, in this case we referred to the Meca 500 programming manual to send the appropriate commands. These commands allow moving and monitor the Meca 500 robot. A ping test will test the reachability of a robot on an Internet Protocol (IP) network. If there is no communication we should verify that the IP of the robot and the PC are in the same local area network (LAN). It might be required to turn off the Windows Firewall or add a rule to allow the communication. 6. Enter the IP of the computer according to the robot IP and a subnet mask.